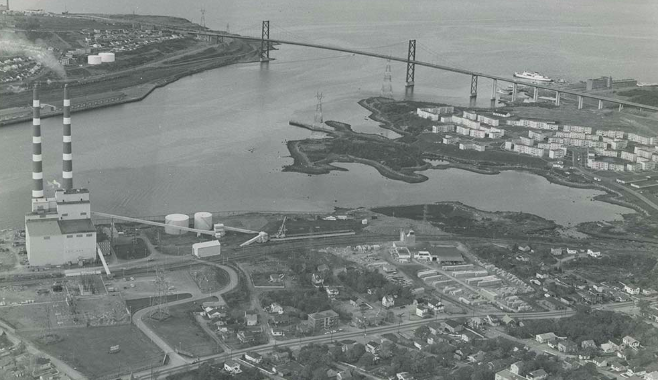 Tuft's Cove, Shannon Park and MacKay Bridge, circa 1973. The peninsula jutting out to the left of the military housing will be soon transferred to the Millbrook First Nation. Thousands of tonnes of contaminated soil will need to be removed before a small portion of Shannon Park can be turned over to the Millbrook First Nation. But how much and how long it will take to clean up the rest of Shannon Park—a parcel of land almost 10 times the size of the Millbrook property and being looked at for potential redevelopment as a CFL stadium—remains to be seen. 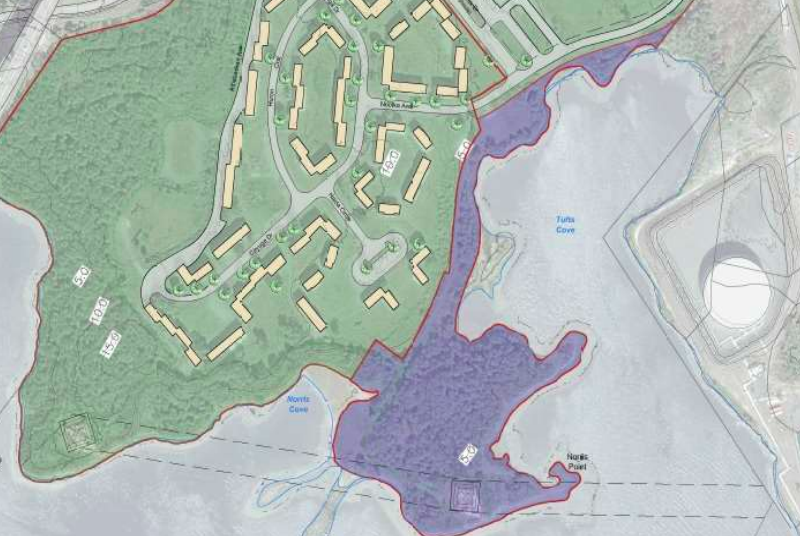 A federal tender issued last week says the winning bid on the smaller Millbrook site will need to excavate, transport and dispose of some 24,000 tonnes of impacted soil from the 10-acre peninsula in Dartmouth. The remediation work is expected to be completed by next spring and could cost the federal government upwards of $5 million. Constructed in 1949, Shannon Park served as a housing complex for military families until 2003. 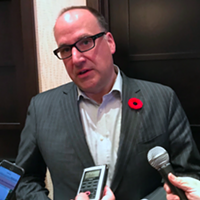 Canada Lands Company, the federal government’s real estate and redevelopment corporation, acquired 96.5 acres of the former DND lands in 2014. In that same year, DND transferred just over 10 acres of the site to Indigenous Services Canada to use as an “administrative remedy” for a land claim Millbrook had made on property in Sheet Harbour. According to Martine Stevens, spokesperson for Indigenous Services Canada, the government has been working closely with the Millbrook First Nation on the project and the band council is fully aware of remediation plans. The purple area is the property set to be transferred to the Millbrook First Nation. 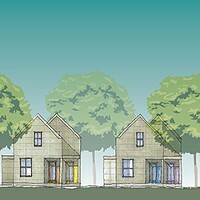 The lands of Shannon Park have long served as a Mi’kmaq community known as Turtle Grove. Most of the area’s Indigenous inhabitants permanently moved away after the devastation of the Halifax Explosion in 1917 and subsequent pressure from neighbouring white landowners to redevelop the property. The site's long history of various uses since that time makes it more than a little difficult to pinpoint the exact cause of the contamination. The impacted areas are limited to a former railway, rail bed, wharf and parking lot. There’s also a small concentration of lead in the area as a result of “painting activities” from Nova Scotia Power’s nearby electrical tower. “Nova Scotia Power is aware of the contamination and is responsible for this portion of the remediation,” writes Stevens. The spokesperson says ISC estimates the contamination originates from when Shannon Park was an active DND community, but that some of the pollution could stretch as far back as the late 1890s. The soil contamination has no connection to the neighbouring Tufts Cove power plant, says ISC, nor did this past August’s oil spill at the plant impact the Millbrook lands. Meanwhile, environmental assessments and remediation for the remaining 96 acres of Shannon Park will need to be conducted by Canada Lands before any redevelopment can happen. 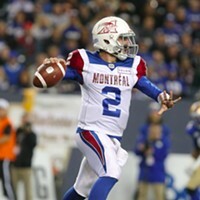 It’s unclear whether the proposed football stadium that Maritime Football Limited Partnership wants to build on the property in time for a 2021 CFL season will hasten those timelines. An Access to Information request made by The Coast this past summer asked CLC for all presentations, reports and analyses regarding the contamination of lands at Shannon Park over the past 18 years. The query resulted in 6,152 pages of relevant files.